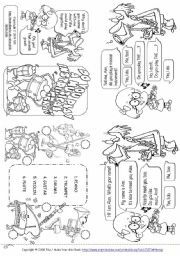 Soime exercises for intermediate students with conditional and time clauses – for future. Cards to practise question forms. How many cards can you complete correctly in two minutes? 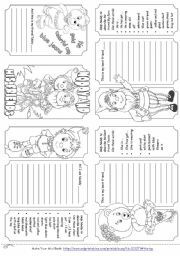 A story book - to be printed double side and cut along the middle line. The inferior part of this sheet is the cover of the book. 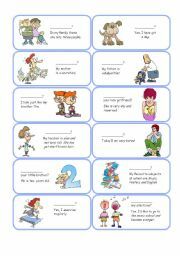 With this story the family vocabulary and the present simple tense could be revised and reinforced. 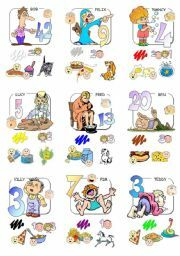 Here are some more Cards to practise Demonstratives and Ir-regular plurals: this boy - that boy - these boys - those boys; baby - babies; leaf - leaves; this puppy - that puppy - these puppies - those puppies ; knife - knives; city - cities. A Mini-Book about musical instruments supposed to be used as a conversation builder together with some interesting characters on speaking cards. 45 speaking cards spread over 5 contributions to stimulate communication. I got the inspiration from the web site http://www.mes-english.com/games/bigtown.php. 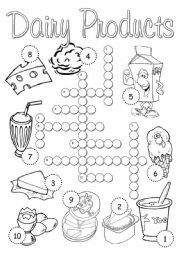 There are accurate directions how to play it, too, and many others very useful ideas. Happy teaching! Reading with clothes vocabolary practising.